Until last Saturday, the only thing that I associated with Pontefract in West Yorkshire, was the bitter liquorice “Pontefract cakes” that my Dad used to eat on car journeys. It certainly wasn’t the sort of place that I would expect to meet someone that had walked on the Moon, and yet that’s exactly what happened. Brigadier General Charles Moss Duke, more informally known as Charlie Duke, was the tenth man to walk on the Moon. Not only did he fly on Apollo 16 with crewmates John Young and Ken Mattingly, but he was also personally selected by Neil Armstrong to act as Capsule Communicator – CapCom – for the landing of Apollo 11. Appearing in Pontefract thanks to the efforts of Ken Willoughby, who helps bring Apollo astronauts to inspire local schoolchildren, Charlie Duke gave a public lecture on Saturday 20th October which I attended. I also had the honour of meeting Charlie over lunch, another fundraising event which makes the school visits possible. I found Charlie to be warm, engaging and happy to share his wonderful experiences. The best thing? You can still sense his genuine excitement about having been on the Moon. That’s what you want from astronauts, a sense that they haven’t forgotten the incredible things they’ve been able to do. Charlie Duke is a great storyteller and we listened attentively to every word. I know that not everyone can get to Pontefract (trust me I had my own problems!) so I’d like to share some of those stories with you here. Charlie Duke was part of the support crew for Apollo 10, worked in Mission Control for Apollo 11 and was back-up for Apollo 13. When that mission had problems he wasn’t sure the crew was going to make it back, but he explained how the team worked 35 hours straight to get them back safely. Then finally, with Apollo 16, came Charlie’s time to ride that behemoth of a rocket, the Saturn V, to the Moon. “We were ready to go” he says, “like a race horse at the gate – let us go!”. There’s still a sparkle in his eye as he recalls waiting for launch. During the countdown itself, as he sat atop of a rocket whose five first stage engines each were more powerful than all three shuttle main engines put together, he was thinking “please don’t stop – let’s go.” “Gimme my chance, let’s launch this thing”. At T-30 thirty seconds, the countdown was still going, T-15, still counting…. With only a four hour window for launch every month, he was keen for the clock to continue counting down, and continue it did, seconds later, the rocket lurched off the launch pad and towards space. “You get a little excited at this point” he says, with a laugh. This is a bit of an understatement. His medical record from the flight shows that at launch his heart was beating at 144 beats per minute, compare that to cool-as-a-cucumber John Young (who had previously flown on Apollo 10), whose pulse was a much more relaxed 70 bpm! The trajectory that Apollo used meant it took them around 72 hours to reach the Moon. You could get there in about 12 hours if you went faster he explained, but there just wouldn’t be enough time or fuel to slow you down enough when you got there. “When we landed I was screaming ‘Yahoo! We landed!’”. Comparing this reaction to that of Neil Armstrong when Apollo 11 landed, he says “Neil was the coolest guy you could imagine – he was like ‘yeah, we’re here’”. But Duke was too excited to come up with something as philosophically deep as Armstrong. “We were pumped up buddy, I can tell you”. Due to a problem in orbit, Charlie Duke and John Young arrived on the Moon’s surface six hours later than they were meant to. This had an effect on their schedule as they were originally supposed to go on their first EVA (Moonwalk) after landing, but were instead instructed to have a rest period before. “You imagine two hours after landing on the Moon someone says ‘go to sleep’ – yeah right buddy!”. With statements like this, you can’t fail to be won over by Duke. After forty years, the memories are still fresh, and despite him being part of one of humankind’s greatest endeavours, an inspiration to millions, he’s still human. I know I certainly would have had trouble sleeping, and its nice to feel, for a brief moment, that we have something very human in common. Young and Duke did three Moonwalks during their time on the lunar surface. “You felt like you belonged” says Duke, explaining that having studied the photos for so long he recognised the features. “Buzz called it ‘magnificent desolation’, I called it ‘awesome desolation’” he adds. Moon dust is like talc, so you didn’t have to worry about getting lost on the Moon, you could always just follow your tracks back again. “What are we gonna do if we come across another set of tracks up here” he quipped to Young, who replied “I don’t think we’re going to”. By the end of the three days up there their suits were covered in Moon dust “it’s impossible to brush that dust off the suits”. Here’s Charlie Duke getting a bit dusty..! The Moon has just one-sixth of the gravity that you feel on Earth and “you felt like superman” says Duke. He and Young had a go at the “Moon Olympics”, seeing how high they could jump. Duke set the record, but fell and landed on his back. “That was scary, mess-up the backpack and you’re dead” he says. “Mission Control was very upset and there were no more Moon Olympics” and with only one more flight in the Apollo programme, to this day he still holds the high-jump record on the Moon. When asked about fear, he says “no-one was fearful, except for that one time when I was doing something I wasn’t supposed to”, recalling clumsily setting the high-jump record. At the end of the mission, Apollo 16 landed within a mile of its target. “The most beautiful sight in all of Apollo is the parachutes” says Duke, referring to the red and white ‘chutes that slow the command module down before it splashes into the ocean. There was only one parachute in the whole of Apollo that didn’t work, he says. Apollo was an amazing programme of science and exploration. A total of 24 people went to the Moon, and only 12 people walked on it. Getting the chance to listen first-hand to the stories, to shake the hand of one of those early space pioneers was a real honour. Charlie Duke, I salute you. I used to think that Pontefract was just the home to a special type of liquorice. Now I associate it with a warm community of UK space enthusiasts, and a very special encounter with the 10th man to walk on the Moon, the wonderful Charlie Duke. 12 Responses to "Amazing Encounters: Apollo 16′s Charlie Duke"
Nice write-up. I spent the previous week reading his book, Moonwalker, in preparation of seeing him. Thought he was very entertaining to listening to, and I’m still in awe of meeting him and shaking his hand. The picture of me shaking his hand sits proudly on a shelf by my desk, and I often find myself turning to look at it. I’m definately going to the next event! Glad you managed to make it there, despite your travel adventures/problems. I’m still to get my hands on a copy of his book. Kicking myself for not buying it at KSC because I hear it’s out of print or hard to get hold of now. There again, after 9 weeks of space uni, there wasn’t really space for anything else in my suitcase! I was there too. One of the best evenings I’ve had in a very long time. 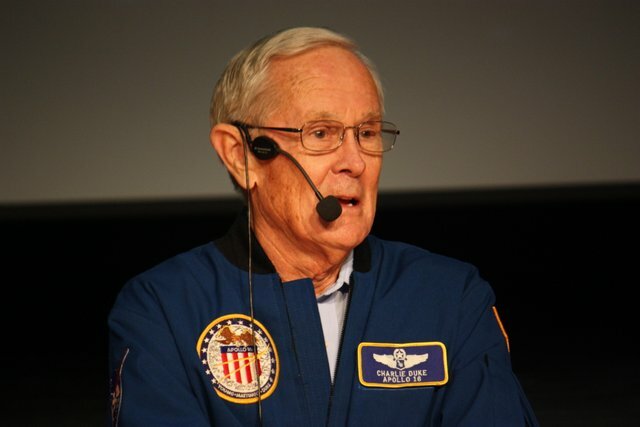 Charlie Duke’s enthusiasm and passion for his trip to the moon still remains, and yet all the while he remains a great ‘down to earth’ (can you say that about someone who has walked on the moon?) guy. A real privilege to meet him and hear his stories and an evening that I, and I’m sure all the other people who attended, will never forget. Hi Kate, at last the ink is dry on the page and was so worth the wait!! You give a very detailed very beautiful account of an amazing man. I feel very blessed to have gotten to know Charlie just a little over the few days he was with us. I was and am still in total awe. The Ken Mattingly wedding ring story brings a smile to my face every time I hear it. You should be very proud of the account you have so eloquently written. I applaud you!! Thank you so much for your kind words. It was so nice meeting you in Pontefract – here’s to the next one! Great to meet you guys in Pontefract – a critical location for Apollo Rendez-Vous 2012. That moment on the launch-pad must be amazing. And even more amazing with hindsight when we think of the technology that managed to get them there and back safely. Youtube is coming up with all kinds of useful resources to illustrate the story. What does Duke think about the conspiracy theorists? People seem to forget that they didn’t just go once. Loved the wedding ring story. How human. Great to hear how the evening went.totally unaware this was going on.i have read charlie duke’s book,moonwalker,what an excellent read.i would love to see him in person.does anybody know you can find out when he will visit the uk again ? I’m not sure when Charlie is next in town, but I think that another Apollo astronaut will be gracing Pontefract in the New Year. I’ll post details when I have them all. This is all fantastic! . I hope it is all still going on. What I find sad, even in my old school where I got a job briefly recently, was that the only reference to Apollo the kids saw was a programme shown by the science teacher about the evidence against it ever happening!! When I was at that same school as a pupil , it was a couple of years after the last mission but we still had the mission with the Russians happening and Skylab, and I remembered coming home from my primary school and watching a programme called “Live from the Moon” so we were pretty excited by space then! I was just saddened that those kids just did not get the chance to learn about space exploration except to see a programme saying it never happened. In my new school. the first thing I did was to buy a piece of the Apollo16 parachute and a photo signed by Astronaut Charlie Duke to display to the pupils as they go to science class- blow the expense! I really want them to have what I had back at school – an amazing inspiration looking up out there at the moon and planets and knowing we were reaching out to them , instead of looking into their phones into cyberspace! It’s a gesture of hope really! What a great thing to do! My science teachers inspired me to do a science degree, but we really didn’t learn anything about human spaceflight, which felt such a shame. I know I would have been mesmorised by it then as I am now. I didn’t make it to the Space Lectures event this past weekend sadly, so I missed Eileen Collins, but Jim Lovell is heading to a Pontefract later this year. Just google Space Lectures and you’ll find the site – book a ticket and we’ll see you there! Great community of people, and you’ll get something signed by the great man himself. Now that would make a great lesson – watch Apollo 13 and then the kids that you met the guy at the weekend? Do it.